At a Death Cafe people gather to eat cake, drink tea and discuss death in an open, safe and relaxing environment. Death is something we’d rather not talk about and yet it affects us all. Death Café is a social movement, aimed at opening up conversations about our mortality. By sharing thoughts, feelings and questions, Death Café helps us embrace death as part of our lives. Join us on Sunday 24th February for an evening filled with life-affirming conversations, facilitated by Rosalie Kuyvenhoven and Rabbi David. Rosalie is an independent and award-winning celebrant, based in Muswell Hill. She creates and conducts warm, sensitive and truthful ceremonies for any life event: baby naming, weddings, funerals and others. 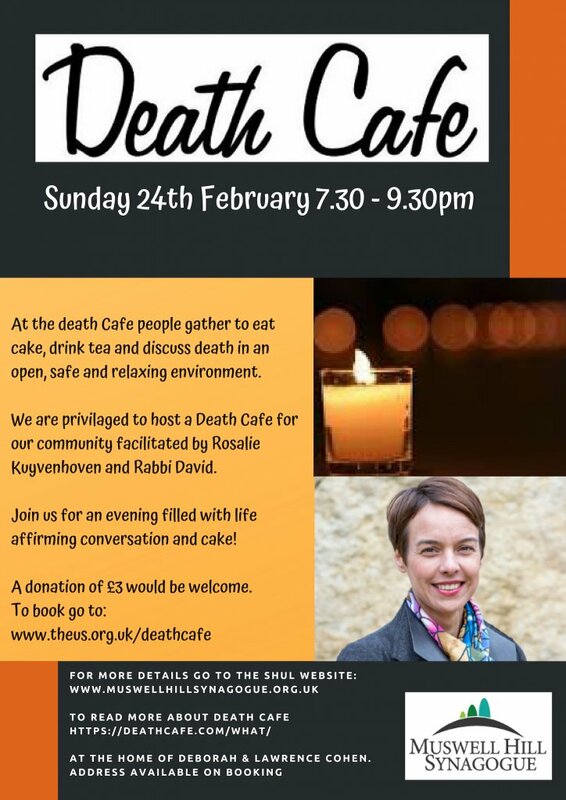 She has hosted Death Cafes since 2016 and has been surprised by the liberating, uplifting and life-affirming outcomes of the conversations. Entry: Free. A donation of £3 would be welcome. Spaces are limited and booking is required.